Since middle school I’ve struggled with my weight – not being naturally athletic and being a lover of cooking and food did not help matters. My twenties and thirties were sprinkled with difficulty – both of my parents died in their 50’s of cancer and my 15 year marriage ended – I ate for solace, and my weight went up and down. Over the next decade I was focused on raising my two children and working to stay afloat. Family meals were comforting and often filled with delicious but unhealthy food – I was fortunate to have two lean, athletic children who did not inherit my weight issues. Happily I found love again in my late thirties which was good and bad for my battle. Dating and new love often goes hand in hand with eating out and social gatherings. 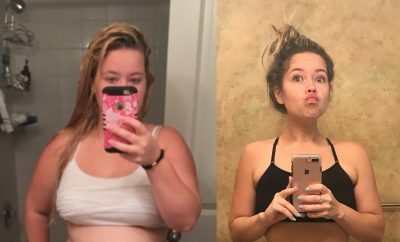 Within two years my weight hit it’s all time high of 259 pounds – I was obese, inactive and sick of the yo-yo diets – I decided I needed serious help. With the support of my family I pursued Lap-Band surgery – I was not a candidate for insurance help so I dipped into my retirement and went forward. The first few years were a mix of weight loss and struggling to adjust to the band and the restrictions it forced on my life. I was happy to have help and very encouraged to lose sixty pounds in two years. Unfortunately, I began to have difficulty with the Lap-Band – it’s not a perfect tool for everyone and for me there were issues with GERD and flank pain that had me in and out of doctor’s offices – my frustration was worse than ever. 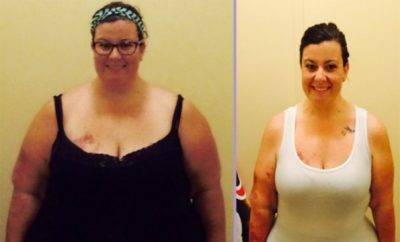 The fluid in my Lap-Band was removed in order for healing to occur and before I knew it I weighed 223 – back to obese, and back to trying to figure out how to break the cycle. 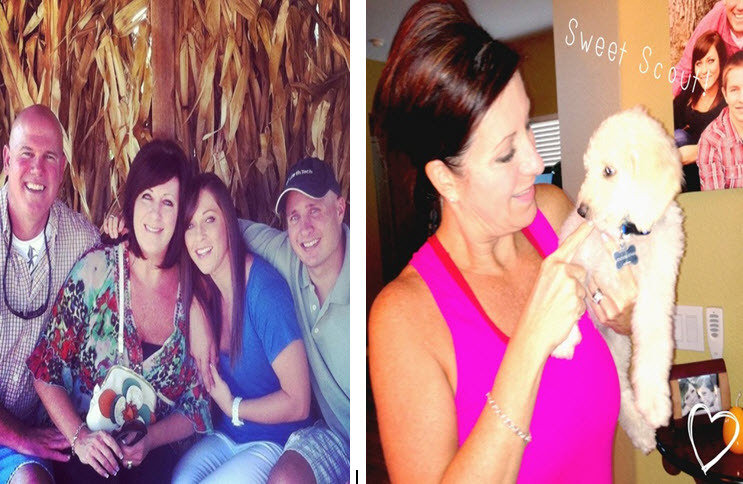 This past March – almost wearing a size 18 again, I faced my 52 birthday. My mother died at age 52 and I had dreaded this particular birthday. Certainly I couldn’t help but think I too would have a short life if I continued on the same path. My blood sugar was registering at the pre-diabetic level and my asthma was a daily problem. After deep soul searching and countless conversations with myself I made a decision to face my 52nd year doing everything that was opposite of dying. For one year I vowed to be as healthy as I could be and see if I could get this weight off the old fashioned way. The media is filled with people who lose huge amounts of weight through diet and exercise, why not me I wondered? In April I joined a unique local Gym called Fitness MD. My daughter had been a member for a year and was in a relationship with one of the trainers there. 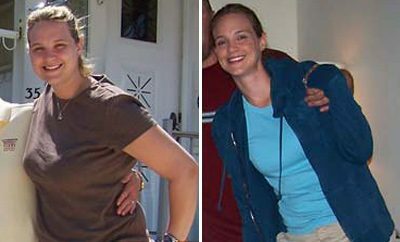 They both insisted that with determination and consistency I could make a huge change in my health and body. Fitness MD offers daily “Fit Club” classes that last one hour, are primarily high intensity interval training and cater to anyone whether fit or flabby. I took the plunge, signed up and agreed to exercise 360 minutes per week and follow a high protein lean diet of 1200 calories per day. My first few weeks I was so sore I joked that I should do an add for Aleve and ice packs. I could barely do a sit-up and could not run a step. But each day I went back and attempted nearly everything the other members were doing – I walked when they ran, I stepped when they jumped and I lifted the weights I was able to lift, each day getting just a little stronger and more confident. I was surrounded by caring trainers that knew when to adapt or modify an exercise, I was encouraged by other members with success stories and then, low and behold, the weight started to fall away. My set goal was to lose 2 pounds per week which I consistently met or exceeded. I logged everything I ate on My Fitness Pal, including lifesavers and coffee creamer and I just stuck to my new life I left work each afternoon and headed to a Fit Club class for one hour. I reminded myself often that one hour is a tiny speck in the day and I was worth it. In order to make it easier at home my husband and I prepare a weeks worth of grilled chicken and vegetables every Sunday – we eat this food every day for lunch and dinner, changing it up slightly with sauces or greens to create some variety. I am now beginning the 5th month of this journey, I weigh 167 pounds which is 92 pounds lighter than the day of my Lap-Band surgery. Most of my weight was lost without the aid of the band. I don’t regret having the surgery, it was part of my journey but I do wish I had been confident enough to give something like this a try first. I am amazed everyday at how far I have come in four months. I can run a half mile without stopping and do over thirty full sit-ups in a row. For the first time since middle school I wear a size 10 and exercising for an hour a day is something I look forward to rather than dread. I committed to doing this for one year but I am hopeful that I do it instead for a lifetime. I know that if I can do this, anyone can. Start with a step and then add two more. Read other people’s stories, watch The Biggest Loser, whatever it takes to get inspired. Find a gym that focuses on the HIIT Method – anything is possible in short intervals! Who knows what the next 8 months will bring – maybe my next goal will be a 5K or 10K? What I am sure of is that there are many ways to lose weight. For some weight loss surgery is the best solution and for others diet and exercise. For me it was a combination of both, turning 52 and deciding to honor the memory of my mother by honoring myself! 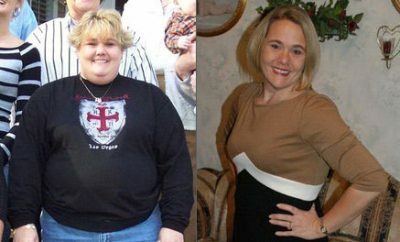 ← Previous Story Weight Loss Before and After: Michelle Lost 51 Pounds And Ditched The Muffin Top! Congratulations! What an inspiration you are! Good for you!!! You look wonderful and so young! You look amazing! I love your story and wish you much continued success. Thanks for inspiring us all. Way to go!!! I’m on this similar journey @ 51! Not giving up this time!! !